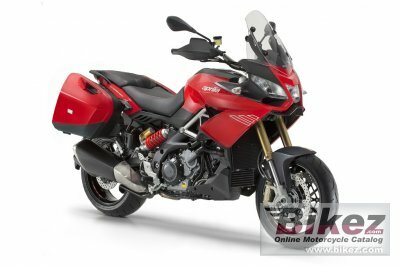 2017 Aprilia Caponord 1200 Travel Pack. Picture credits - Aprilia. Submit more pictures. ADD has two primary objectives: one is to optimise rider comfort and the other is to further improve general rideability and safety. The system measures the energy transmitted by bumps on the road surface to the bike and adjusts the hydraulic fork calibration and shock absorber in real time to minimise accelerations on the frame and consequently maximise comfort. Frame type: Modular tubular steel frame fastened to aluminium side plates by high strength bolts. Removable steel rear subframe. Front suspension: Sachs upside-down front fork with fully adjustable compression and rebound damping and spring preload. Wheel travel 167 mm. Rear suspension: Aluminium alloy swingarm Sachs hydraulic shock absorber with adjustable rebound and preload. Front brakes: Double disc. ABS. Four-piston Brembo monoblock radial calipers. Rear brakes: Single disc. ABS. Brembo single piston caliper. Comments: Two channel Continental ABS. Traction Control. Windscreen. Ask questions Join the 17 Aprilia Caponord 1200 Travel Pack discussion group or the general Aprilia discussion group. Get a list of related motorbikes before you buy this Aprilia. Inspect technical data. Look at photos. Read the riders' comments at the bike's discussion group. And check out the bike's reliability, repair costs, etc. Show any 2017 Aprilia Caponord 1200 Travel Pack for sale on our Bikez.biz Motorcycle Classifieds. You can also sign up for e-mail notification when such bikes are advertised in the future. And advertise your old MC for sale. Our efficient ads are free. You are also welcome to read and submit motorcycle reviews.